One of the comments to the post correctly calls out the missing sriracha and hoisin sauce (these requisite side-kicks can easily be added to the smallest bowl that currently holds the wedges of lime). It’s a neat design for sure but probably not practical as any waiter or waitress from any pho restaurant will agree. 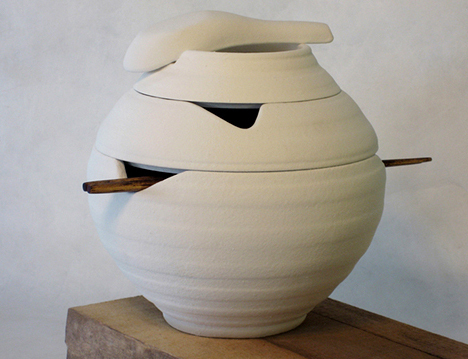 Pho is best served piping hot and this bowl would be difficult to carry. Maybe some insulated handles on the sides or top that enhance the lantern look? How/where can you purchase pho bowls? I really like the looks of this lantern-bowl set. Hi i’m inquiring about this product, I’m VERY interested as a christmas gift for my mom. I had asked you about this product a year ago I believe, but not much response, so was wondering if this is still available. Where can I buy Pho bowl and spoons and serving sets? Please tell me where I can buy this set. This is amazing! 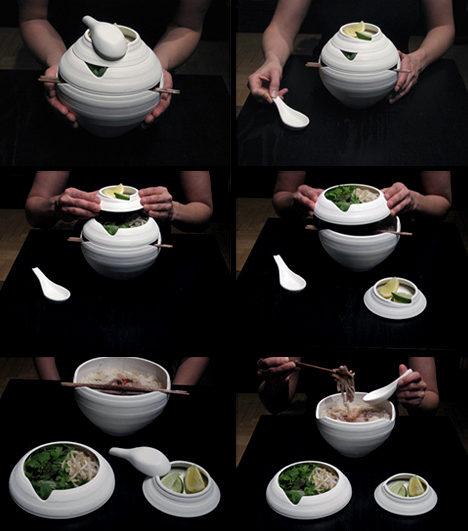 Where can I buy a lantern shaped pho bowl? I do not know the price of this bowl set. I am extremely interested in purchasing. How much? And how can I get a set?